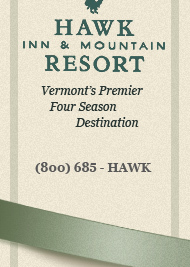 You can visit Hawk Inn and Mountain Resort for an extended stay and never run out of things to do. As an upscale destination, we make sure you and your family will be catered to completely. And, we are truly a year-round resort. Take a look at the different seasonal activities, located in the menu at left for more information. If you choose to venture outside our resort, the beautiful Vermont countryside will have you coming back again and again. We are located in the heart of the Green Mountain State and because of that, you're always within easy reach of the abundance of cultural attractions that occupy Vermont's many small towns and villages. Exploring these quaint little hamlets will provide days of enjoyment, whether your interest be historical, recreational, educational or simply to indulge yourself in some of the best shopping around. Antiquing is renowned throughout the region, with many a spectacular bargain to be found in the numerous antique barns and country auctions year-round. The area is also endowed with countless charming galleries and shops where treasures await your discovery. In the warm weather months, there's summer theater, outdoor concerts, and many excellent restaurants, including The River Tavern, right here at Hawk, where dining under the stars will bring you closer to understanding the unique nature of our delightful little corner of the world. When the brisk chill of autumn breezes sets the mountains ablaze with brightly colored leaves, it's the perfect time for touring either some of the most beautiful stretches of road in the country, or simply the elegant natural surroundings of Hawk's 1200 acres. And when the snows begin to blanket the terrain, residents and guests step into their skis or snowboards and it becomes abundantly clear that Hawk is surrounded by trail-ribboned peaks - Okemo to the south, Killington to the north, and the private Bear Creek Mountain just up the street.